← Come Celebrate With Us! Did you know that November is Native American Heritage Month? It seems only fitting that during the month in which we celebrate the first Thanksgiving the English Settlers and the American Indians shared back in 1621, we should take some time to learn more about the people that called this land home long before the “Pilgrims” ever arrived. Here are just a few places on the internet that you can check out to learn a little more about Native American culture and heritage: History.com, Wikipedia, National Museum of the American Indian website, and countless more. Did you know that from 1963-1980 there was a Junior Proficiency Badge called Indian Lore? It featured an embroidered image of a Native American kachina doll of the Native American Hopi tribe. It is a figure carved of wood, or root, and it is used to teach young girls about the katsina, beings that control aspects of nature such as rain, and act as messengers between people and the spiritual world. 1. Know the history of the Indians who once lived nearest your home. Describe their homes, costumes, and food and tell where their descendants live today. 2. Describe briefly the different kinds of Indians that lived in North America. Tell how their way of life was affected by the part of the country in which they lived. 3. Tell what states have names of Indian origin. Give the meaning of three names. 4. Read at least 3 Indian legends. Choose one and tell it to a group of Brownies or other friends. 5. Make a useful article such as a sheath for a knife or ax and decorate it with authentic Indian designs. OR make a model of a tepee or other type of Indian dwelling. 6. Learn to play an Indian game and teach it to your patrol or troop. OR show some Indian dance steps OR perform an Indian dance in camp or at a troop meeting. 7. Teach an Indian song to your patrol. Explain its meaning and how the song was used by the Indians. OR make a simple Indian musical instrument and use it in camp or at a troop meeting. 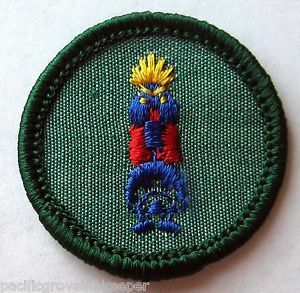 Although the Indian Lore badge was unfortunately retired in 1980 it can still be earned and if you are interested in acquiring some of these badges for your troop, please contact us! We have many resources at our fingertips to help you in your search. Keep an eye out for next week’s blog post as we here at the GSGATL History and Archives Committee continue our celebration of Native American Heritage Month! Posted on November 20, 2014, in Badges, Junior Badges and tagged American Indians, badge, holidays, Native American. Bookmark the permalink. 2 Comments. Sue, we do have a limited number of the badges in our collection, but I will make sure that if anyone is interested in finding these that I will use my resources wisely! We have access to many other Council Archives now and I know they can be acquired.